Allina's Aspen Medical Group will consolidate three St. Paul clinics into St. Paul’s historic Bandana Square building. [Minneapolis/St. Paul Business Journal, March 2, 2012] Allina Hospitals & Clinics plans to consolidate three St. Paul clinics into St. Paul’s historic Bandana Square building. 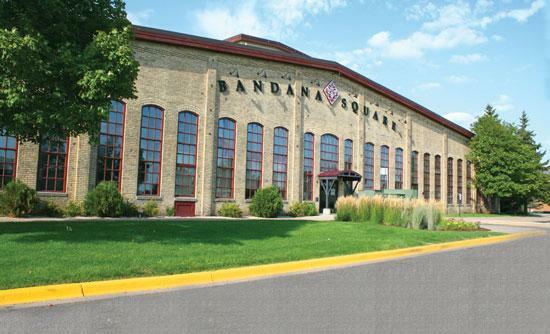 The lease will fill the remainder of the 138,000-square-foot Bandana Square, at 1021 Bandana Blvd. E., and complete the turnaround for the property envisioned by real estate developer Steve Wellington when he bought it nine years ago. Allina’s Aspen Medical Group clinic will occupy 67,500 square feet in the 127-year-old building starting in November. Read the the full story at the Minneapolis/St. Paul Business Journal (subscription required to read full story).